I have photos, many photos! I've had quite a few musings over the last few days, but not felt the inclination to write them down... and now, I don't think I can remember them!! So, this is mostly a photo blog! Enjoy! A snapshot in the kitchen! Actually, got to be honest, it's not a great pic! Ethan decides he wants to feed himself :) His fetching little outfit includes a new look babies t shirt (moose print), a Polarn O.Pyret vest (Po.P), giraffe print baby legs & cow print socks by Soggs. My smiley boy :) A cute hat by Liten, a Po.P bear print vest and cow print harness covers by Snuggle Monkey. Here's Ethan on a date with Esme in Coffee #1. Awww, my little angel holding hands with his cot buddy whilst he sleeps. Uh oh, Ethan has two girls on the go! Here he is with Olivia - he's wearing a cute moose top from John Lewis. My star baby with his Godmother to be Luc - and here I'm sporting my fun Christmas t-shirt from Cath Kidston - yay! In Lidl self feeding in the dairy isle.. It's a bear! Rocher John Rocher bear suit - too cute! May I connect your call? Lindex cloud t-shirt over ej sikke lej owl vest. With Godfathers to be, Chris & Uncle Phil (bro) sporting a lovely rainbow kids romper. Our & about in Bristol with his fairy lights! I went to Lush and got some bubble bars knot wrapped! And I'll be using this as a scarf after Christmas when it'll be infused with lovely Lush smells! Some Mummy hugs! (I've re-dyed my hair chocolate brown). Weaning begins! Feeding in the bumbo at the moment... the high chair saga is at least finished now though when the new, unbroken one arrived today. Christmas! Sunday we bought the tree and I decorated in the evening. And now I must to bed! ..and I can feel it! Yay! So looking forward to getting our tree in a few days. Will have to get the decorations out soon! I've written all but a few of the Christmas cards, so need to buy some stamps. Also bought nearly all the presents. I've got loads of bargains for Ethan on ebay, lots of lovely wooden toys. Linkies! That last link was a particular bargain! Three wooden toys for 99p (and postage...). Soooooo... what have we been up to? Had a busy week actually. I had a brilliant start to the week. My parents looked after Ethan for the day and I escaped to Bristol to do some Christmas shopping... well, really to spend my Christmas money. I started off on Park Street and went into Westworld first. I've always been partial to Bench clothing. They had everything reduced by a considerable amount, but better still, I was stopped by a SA as soon as I entered the store and told that if I bought 2 items of Bench I'd get an extra 20% off and if I bought 3 items, 30% off!! So, of course I was on a mission to get 3 items. I found quite a few lovely items, and in the end, for £57 I got a dress, 2 pairs of jeans (skinnies.. I just don't like boot cut or boyfriend on me anymore), a pair of black cargo type trousers (that came in at £3 reduced from £45!) and a cardigan. BARGAIN! No photos until after Christmas though I'm afraid... they will be wrapped up and under my parents tree until then (once it's up that is!). So.. my shopping trip got off to a good start, and I was buzzing. I strolled further up Park Street in the rain, making a quick stop at Cath Kidston for some clothes and dusters (got to make the house work fashionable!). I then crossed over and nipped into Fat Face (I love looking at their snugly winter socks!). I was seduced by a rather gorgeous pair of purple & red ear muffs and a purple snood type thing with pom poms. Again, pics after Christmas! After that I made my way into Broadmead and visited Lush - bought a Jingle Spells ballistic, 2 Cinders ballistics, a Banksy BBS & some Lip Service (still can't find a better lip balm anywhere!). I got them wrapped up in a vintage scarf http://www.youtube.com/watch?v=cLjiZp0CZCY Personally, I'm a big fan of this. You pay £4 for the gift wrap/vintage scarf. You choose the scarf from their selection and they wrap them in front of you (using your input). I loved it so much, I want to go back to get more stuff just to get it wrapped! I had to visit Primark (the new Bristol store is massive, and well laid out). Spent £14 and got a balloon style mini skirt, some woolly tights, leg warmers and a pair of flat red mj's. Woo! I finished off with a lovely relaxing mocha frapachino in Starbucks and then drove home back to "the motherlife" as my friend recently called it (I think she meant motherhood, but I rather like her new phrase!). Tuesday was spent hanging out with antenatal buddies & babies. Have some lovely pics from that day! Wednesday I took a trip to Worcester with my parents to see my great aunt Barbara (Ethan's great great aunt!). That was lovely, but only a flying visit. Thursday and Friday followed with the usual combination of hanging out with babies and drinking coffee. I think that's where I'll leave it for now. When I retrieve our camera from wherever I've left it I'll do a big photo blog update! Just been reliving memories by reading our honeymoon blog... check it out if you have some spare time. I know I'm biased but I think it makes pretty good reading! OK... I've not figured this particular blogging site out yet... blogger always posts images at the top of the blog.. so for now, I'm not going to faff around with these and I'll just leave them here. 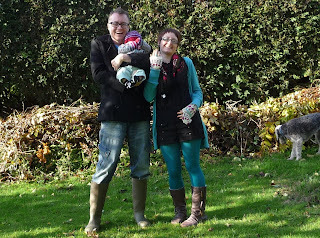 At the top we have a recent family photo, followed by a Mummy & Ethan shot, Ethan in a box with Cath Kidston tap over him, and yellow nails amongst ivy! I'm currently sitting on the sofa, thinking about bed and drinking cava... ahhhh, delicious cava (wish I could afford champers darhhhhling). I do love the alcohol aspect of not breastfeeding! Perhaps that's why some people assume my nickname Al is actually short for alcoholic and not Alex.. I hope not! This afternoon, Ethan's 'Aunties' Luc & Alice paid a visit. It was really lovely to see them and lovely for them to spend time with Ethan. We all paid a visit to my favourite shop in Clevedon, Wilfred & Alice. I think we all parted with some money!! Got Ethan some gorgeous wooden letters spelling out his name as part of his Christmas presents. OK.. back to clothes.. I've not worn anything exciting today. I will however take a good look through picasa and post any photos I think may be of interest.. Here I go.. OK... they are at the top of tonight's blog! Making my first entry when I really need to be in bed.. such is the life of a mum!! My husband is balancing one of our dining chairs on one hand as I type... Strange boy. Right, what do I want to say. I've had a few blogs in the past, I don't know how I'll mange with this one, but what I want to record are details of my time with my beautiful baby boy and our exploits into fashion (i.e. the cool and sometimes bizarre outfits I put us both in!). Why? Well, firstly, since having my baby, I've been diagnosed with postnatal depression (PND) and at first lost all interest in my clothes, fashion and my appearance. Since taking steps to deal with the PND (mainly citalopram - I thank you NHS!) my mood has lifted and my interest in clothes has increased, beyond what it was before! 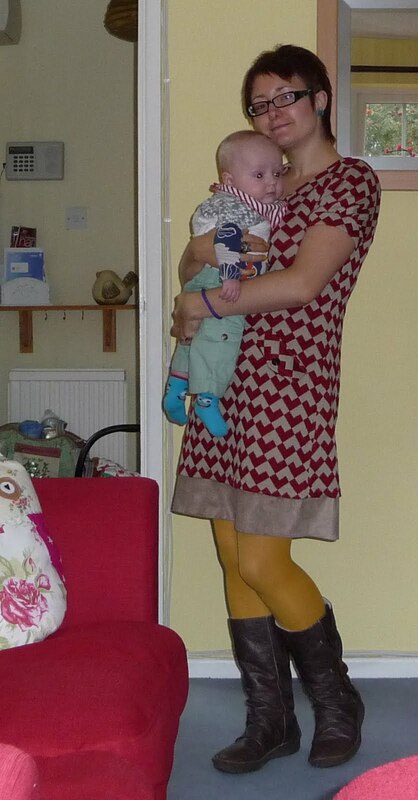 I am loving dressing myself and my baby up. My feelings towards my body are better than they have ever been, even before pregnancy and motherhood, which I think is adding to my enjoyment. Secondly, I really want to keep a record of the nilestones my little man reaches (whilst looking ever so cool!). Thirdly, so many people have commented on the way I dress, and the way I dress Ethan that I feel a record of outfits is completely desereved... nay, required! I really ought to get to bed, bless him, he still wakes in the night, and I have a hair appointment at 10am as well. Will add some pics to kick things off. Night!